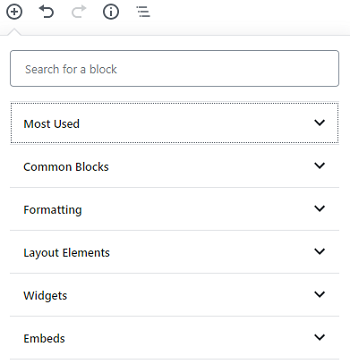 The new Gutenberg editor in WordPress is made with tons of blocks like a page builder tool. It allows you to use own skills to design pages and deliver a unique user-experience to your readers. The blocks are available for any content type like texts, images, videos, social media embeds, and others. Choose a block that matches your requirements, add, and customize it as needed. It is simple and easy to use. 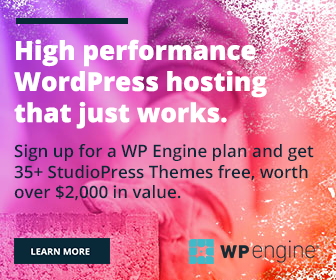 Even though it may take time to get acquainted with the new interface of WordPress post editor. Many users say that Gutenberg is complicated and they want to keep using the old classic editor on the website. 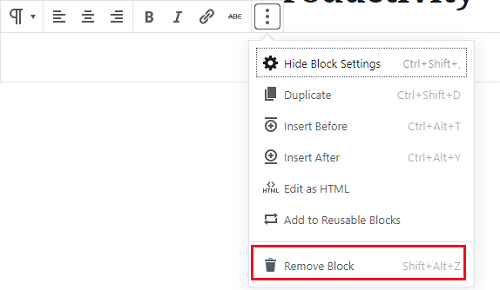 If you are one of them, learn How to Disable Gutenberg and Return to the Classic Editor in WordPress. Place your cursor at the beginning of a paragraph, to get options like this. Click the ‘+’ icon from the left-end to add a new block to your screen. Alternatively, you can also click the ‘+’ icon from the top-left of the main window for creating blocks. Expand each section to view blocks in them. All blocks that we need regularly will be listed under the Common Blocks section. Click on a block name to add it to your editor. I assume you created a paragraph block as an example. Enter your text and when you finished typing, a small box will appear just above the block you are using. It contains options to change the block type, alignment, format and hyperlink the texts. You can view more settings on the right pane of the screen. Adjust your font size, assign colors and customize the block using CSS class if needed. Press Shift+Alt+Z keys together to delete your current block. If not, press spacebar on your keyboard to get formatting options. Click the three dots icon from the top-right side. Choose Remove Block from the drop-down menu. Your current block will be deleted.